Whether you’re an experienced veteran, or applying for your first pharmacy job with no experience, our pharmacy technician cover letter sample and expert writing tips are the medicine you need to relieve all your job-search related headaches. On the other hand, if you’re in a rush, use our professional builder to fill your cover letter prescription in minutes! Not the what you’re looking for? 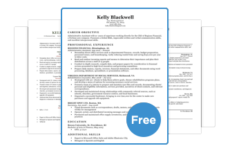 Browse our library of cover letter examples to find one in your industry. Thank you for the opportunity to apply for the open Pharmacy Technician position at [Target Company], as advertised on indeed.com. [Target Company]’s reputation for excellent customer service is unparalleled. I am a certified pharmacy technician (CPhT) and I am confident that my strong track-record of maintaining customer relations in high-traffic pharmacies makes me the perfect candidate for the job. I noticed in your job description that you prefer candidates who have knowledge of intravenous supplies. I received my Sterile Products (IV) certification last October, and have since prepared an average of 11 IV packs per day at my current job. I hope you will give me the opportunity to continue to excercise these skills at [Target Company]. I’d love to come in and talk more about how my extensive experience working in a pharmacy can be of benefit to [Target Company]. I can be available any day of the week if given advanced notice. Feel free to contact me by email at [your.email] or by phone at [your number].Thank you for your time and I look forward to hearing from you. Trying use your extensive experience to take your career to the next level? Whether you’re looking to snag the lead pharm tech position at your local retail store, or applying for a job in a hospital, these tips will take the pain out of writing your cover letter. Many pharm technician positions do not require any type of certification, but hiring managers will always prefer a certified applicant. As such, if you possess the standard certification from the Pharmacy Technician Certification Board (PTCB), always mention it within the first paragraph of your cover letter. Giving the hiring manager quick access to this important information will make you immediately stand out from the crowd. If you’re applying for a job in a hospital or other type of medical facility, being trained in one of the various specializations offered by the National Pharmacy Technician Association (NPTA) is an added bonus. Telling the hiring manager you already know how to handle IV’s or chemotherapy drugs will have them practically begging to hire you. If you’re an experienced pharm tech, you can (and should) include bullets from your resume’s professional experience section in your cover letter. Choose your three most impressive achievements — that are relevant to your target company — and place them in the middle of your letter. Make sure that the achievements you use are quantifiable. Nothing impresses a hiring manager more than accomplishments that are clearly defined and proven by numbers! When writing a cover letter, doing some research on your target company will always give you an edge over the competition. Find out what your target company specializes in and think about what you can do to fulfill their needs. Do they emphasize good customer service? Do they have specific best service practices? Which medical insurance companies do they work with? What kind of pharmacy management software are they using? Once you have the answer to some of these questions, find the ones that match your skills, knowledge, and experience. Then, pick the one that would benefit your target company most and put it on display for the hiring manager. If you’re trying to apply for a job as a pharmacy technician with no experience, don’t be intimidated by our sample cover letter above. There are plenty of pharm tech jobs that don’t require experience and you can still use it as a template to write your own. Just follow the tips below and you’ll have a stellar cover letter that no other inexperienced candidate can match. When applying to be a pharm tech with no experience, make sure you have a strong grasp of the essential building blocks of a great cover letter. If possible, it’s always best to address the hiring manager by name. For pharm techs, the person reading your cover letter will usually be the head pharmacist (often called the pharmacy manager). Finding out the name of the manager and directly addressing them in your cover letter is especially important if you are applying without experience. It shows that you’re willing to go the extra mile and you’re serious about the job — both of which will make a great first impression. As for how to actually find out the manager’s name, it’s easier than you might think. Most retail pharmacy websites have a store locator or “find a pharmacist” search option that will give you a list of the people working at a particular branch. Simply search for the branch you are applying to and you’ll have a list of all the pharmacists working there — including the manager. If this doesn’t work, there’s also nothing wrong with calling the store and asking for their name directly. So, how exactly do you fill up an entire cover letter page if you have no experience? The key is to highlight your skills, experience, and personal traits that are transferable to a pharm tech position. Take a look at the job description and think about what skills or experience you possess that could be used to complete the tasks described. Take a look at the job description and think about what skills or experience you possess that could be used to complete the tasks described. Once you’ve found some, emphasize them in your cover letter and explain how you will use those abilities to benefit your target company. When you have no experience to leverage, you have to use all other tools at your disposal. Showcasing your enthusiasm for the job is one excellent way to win over the hiring manager. All of these phrases will help convince the head pharmacist that you have a strong desire for the job and put you one step ahead of competing applicants. Referring to the job as “an opportunity” will also help get you into the pharmacy manager’s good graces. In order to leave a lasting impression, you need to have a strong closing statement. Regardless of your experience level, the last paragraph is going to be the same. This makes it a unique opportunity to stand out when writing a pharmacy technician cover letter with no experience. Including these elements will make you sound professional, polite, and confident — all qualities any head pharmacist would want in their staff. If you plan to follow the tips above, don’t stray too far from your phone. A call from the head pharmacist will be coming your way before you know it. Otherwise, if you’re looking to save time and effort, get your cover letter done in a flash with our professional builder.